The Association of Closet and Storage Professionals (ACSP) is a national organization formed to unite and educate storage professionals about all aspects of the storage industry. In 2005, the ACSP evolved from the existing NCG (National Closets Group) and now covers a wide range of storage solutions for closets, garages, laundry rooms, mud rooms, home offices, entertainment centers, pantries and Murphy Bed solutions. The ACSP prides themselves on educating storage professionals. One of the best tools of the trade is their Planning Guide. Regardless of your level of knowledge or experience, this is an invaluable tool for anyone in the industry! 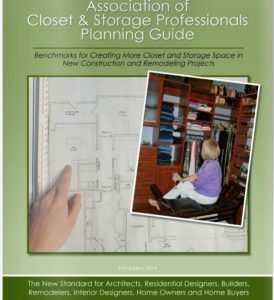 If you are interested in purchasing this guide, please visit http://www.closetpros.org/order-the-printed-planning-guide.html. Members are always up on the latest and greatest trends and installation techniques. Members can advance their careers with marketing materials. An ACSP membership lets customers know you’re serious about storage. In addition, the ACSP hosts the Closets and Cabinets Conference and Expo yearly. This year’s conference will be located in Somerset, New Jersey April 9th – April 11th. We are looking forward to attending the Closets and Cabinets Conference and Expo and will provide more in-depth coverage in a future blog post. In the meantime, have a look at their website, www.closets.org, and join in the storage fun today!